Geology and Terrain / Making an entire continent and exporting it to UE4? Possible? I am a hobbyist but I have a little experience with Unity. Just not with World Machine and UE4. With Unity there was a tool called Gaia that allowed me to create 8k to 8k map and customize it in the engine by stamping different height maps built into the tool to add mountains, hills or dunes to the ground mesh. It did a bulk of the mundane work which allowed me to focus more on the details and map issues. 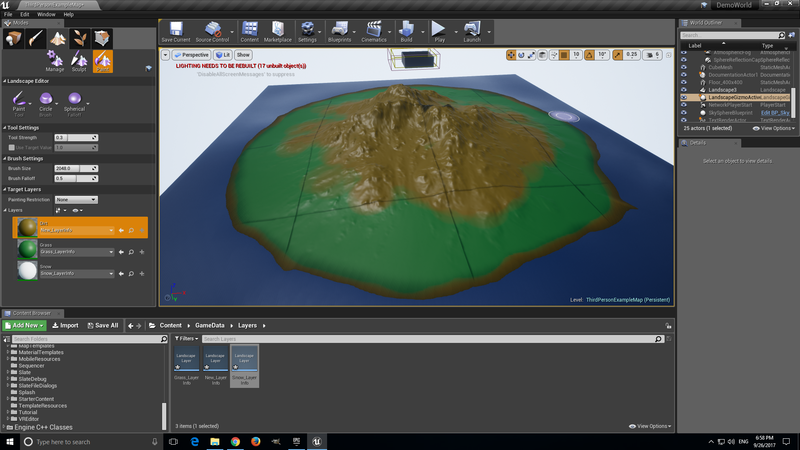 With World Machine Basic I was able to make 505 to 505 island map for UE4. My question is did I miss any steps? What do I do from here to make this island look realistic? Are there any tools to generate all the textures, bushes and trees? If I want to make changes to the island like make it less round or... just create an entire continent the size of Skyrim and have a system proceduraly generate the entire map's textures and assets. What and how do I achieve these results? You know besides paying a thousand dollars in software or quitting my day job to get this done? Thank you everyone for your time. PS. this is for a non-commercial project.